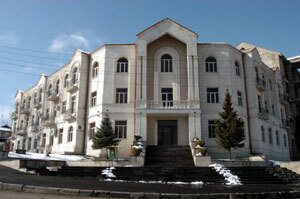 The old Karabakh Hotel in the heart of Stepanakert is being completely renovated by Diaspora. Utilities are mostly reliable, cellular phone service is available, the best road in the region connects Karabakh to Armenia and a new highway will soon replace rutted pathways for internal travel. Most of the population is unemployed. Outside the capital, rural life is often a century behind the rest of the world. 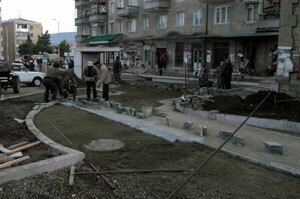 And while development is the key to its future, recovery is a ball and chain that holds Karabakh to post-war reality. Sixty-five percent of this year’s budget will be spent on social needs. Most significantly, the lack of a peace agreement with Azerbaijan cripples Karabakh’s chances of normal international relations. While throwing a shadow on all that would otherwise make Karabakh sparkle, it is also those very realities that make the republic’s considerable rise toward self-reliance a lesson in overcoming odds. It is a lesson written on the faces passing those new streets and visiting the new shops and enjoying the new cafes – faces that not so long ago had a downward glance, guided more by memory than by vision. Arman, a bartender at the Cascade café across the street from the Ministry of Foreign Affairs, says his job offers a barometer on the psyche of his city. He says that students from Artsakh University are frequent customers and he notices a more upbeat expression in their attitudes. Irina, one of those students, says there’s reason for herself and her friends to enjoy themselves. Others notice too. Last year some 3,000 outsiders visited Karabakh, nearly twice as many as the previous year. And far more than might be expected in a territory where the term “ceasefire” is the main guarantor of safety. Businessmen are banking on that guarantee holding, and are attracted to Karabakh by government-directed investment incentives that temper concerns about setting up shop in a “risk zone”. Building blocks lay the foundation for a people on the move. The Franck Mueller Company of Switzerland is among jewelers doing business in Karabakh. Another Swiss firm has plans to invest up to $2 million to reconstruct the Karabakh Hotel in the center of Stepanakert and says the hotel will include boutiques and restaurants and a banquet hall for 500. Future tourists may have little evidence of conditions that cause regular visitors to stand in awe of today’s Stepanakert. One of Armenia’s most popular singers, Shushan Petrosian, has been visiting Karabakh since a month after the ceasefire in 1994. “Each time I visit Karabakh, I see evidence of their pride and endurance,” Petrosian says. “Before my eyes I see the transformation of Karabakh from a war torn country to one that’s gaining stability and success. It is, though, a limited liberation; development is constrained by Karabakh’s status as a “de facto” entity in the eyes of the international community. Karabakh’s potential, says its prime minister, Anushavan Danielian, “can be compared with an iceberg in which only a little part is above the surface and the rest is not visible. 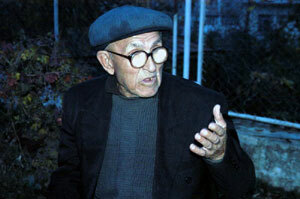 90-year old Dedo Arakelian: “I have the world before me.”. It is a difficulty government leaders have minimized by implementing tax breaks that between 2001 and 2003 helped attract $40 million in investment to Karabakh. Significantly, $13 million came from non-Armenian or non-Diaspora sources. According to the Prime Minister, until 1999 there had been zero investment from non-Armenian sources. Last year, foreign investment was about $8 million, up four times over the previous year. “Any businessman who comes to our country has an open door to meet with ministers on that very day,” Danielian says. “During implementation of any project, we go see how we can be helpful with it. It is a republic few outside will admit to, but all in the neighborhood acknowledge as a key to regional stability. But, while the Prime Minister may be right about businessmen “ambassadors”, at diplomatic meetings that matter most to Karabakh’s future, even the republic’s President is excluded. Peace talks are held between Baku and Yerevan, with (former president of Karabakh) Robert Kocharian the “de facto” representative of the de facto republic. Neither the Prime Minister nor the President is optimistic that a settlement is within reach. Karabakh’s impressive progress aside, the effect of its current status is a lingering limbo that frustrates more substantial development and restricts involvement by governments that might otherwise find ways to participate in the republic’s growth. For example, the US Agency for International Development (representing the State Department of the United States) is restricted in the type of assistance it can offer Karabakh. Under conditions of the Freedom Support Act, USAID has, since 1998, allotted about $35 million to Karabakh. But because Karabakh is diplomatically seen as a “break away, self-declared republic”, the American government’s assistance is limited only to humanitarian purposes, i.e., rebuilding hospitals and schools and other “emergency intervention” projects. The capital from the road to Shushi.. US representatives say the issue is too sensitive for them to risk speculation of what could be, if Karabakh and Azerbaijan reached a peaceful settlement. But outside the realm of official comment one might compare Gyumri with Shushi as an example of what Karabakh is missing out on because of the unsettled conflict. 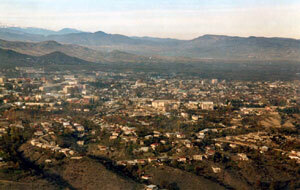 Karabakh’s “second city”, Shushi, once had about 12,500 residents. Today it has about a fourth that – and those live in mostly squalid conditions among battle ruins. But because Shushi is classified as a “green zone”, that is, an “occupied” territory, USAID is prohibited from carrying out any activity there. By comparison, in Gyumri, the agency has funded a three-year, $31 million urban redevelopment program that by the end of this year will have helped more than 5,500 families purchase houses. It is a testament to their endurance and outright stubbornness that the Karabakhis (substantially relying on Armenia for manpower and firepower) survived a war against a bigger enemy. It is an equal accomplishment that there is now starting to be evidence of what they were fighting for. Still: Who can help but wonder what could be? Tigran “Dedo” Arakelian is not among those speculating. At age 90, his life is okay, he says. He lives in a home for the elderly, Karabakh’s first, built in 1995, where he tends a garden, plays dominos and chess, and is known to dance when the occasion calls for it. “I feel like I’m 60 at most,” Dedo says. In his lifetime, Karabakh has gone from being part of Armenia to being part of Azerbaijan, to now claiming its independence. Perhaps Dedo, who has never married, speaks for his country when he speaks of his own hopes of finding a wife.